During winter season on Wednesday and Saturday afternoons games to start at 12.30 pm. Registration compulsory by 12 noon. Two games, one of 11 and the second of 10 ends played. Open gender triples. Cash prizes given, including a game day jackpot. Afternoon tea between games. Green fees $6 with option to buy a pie for $2.50. Drinks available at the bar. Contact Ken Byrom for more info on 0407 617 372. Friday Bowls available all year, weather permitting, green fees $5 with morning/afternoon tea included. Chocolate bar for the best rink. Starting time varies with the seasons. From Friday 11th April 2019 start times will be 10.30 am registration for 11 am game start. Contact Nadene on 8264 0016 for more information. Played Tuesday and Thursday nights October to March, with a break over Christmas. Open gender with one pennant player permitted playing lead or second position. Dress code casual but approved bowls shoes must be worn. Finals against other clubs played at end of season. Bar is always open and opportunities to win cash for best scoring rink and other prizes on the “chocolate wheel”. Fun social night. 2018 season is now complete. Registration nights for 2019 TBA. Competition starts the following week. No green fees for registration night. Get your team organised and hope to see you all on registration nights. 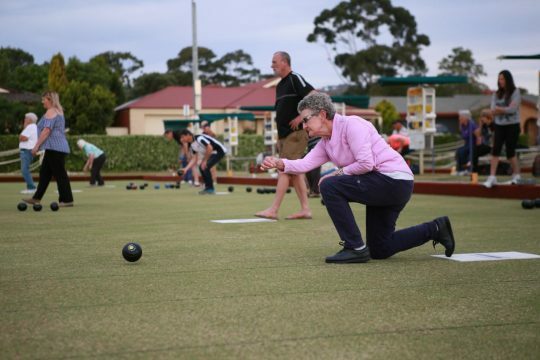 Indoor Bowls for Women, Men and Mixed April to August. Played on Sunday evenings in November to March, final in April, at various clubs. Gold, Silver and Bronze sections. Contact Men’s Secretary Paul on 82648323 for more information. Events are organised by the Social Committee. Secretary Margaret Bibby 8263 1238. Teas every Friday night except Easter and between Christmas and New Year. Club championships are held every year in both Men’s and Women’s sections organised by the Tournament Directors of each.